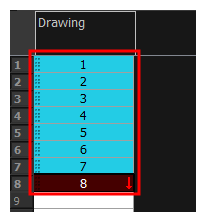 The Create Cycle dialog box lets you create cycles from a series of drawings and exposures. For tasks related to this dialog box, see Creating an Exposure Cycle . In the Timeline toolbar, click the Create Cycle button (you may have to customize the toolbar to display it). Lets you specify the number of cycles, including the current selection.